There is no need to shiver at the thought of winter 2017 approaching and bringing a lot of discomfort in its wake. Consider it an opportunity to deck you out in styles that would be considered serious fashion misdemeanors in summer. Think of fur. Fur is associated with regions that are bitterly cold and are considered the perfect choice to keep comfy and warm even in bone-chilling blizzards. With a slinky, sleek and warm fur enveloping the body one can even take a walk and enjoy it. The cold simply never gets through. There is another reason to consider genuine fur. It is back in style. Fur gives warmth. It also turns heads. Naturally, a fur hat is a must for winters as is a fur coat but what about the area in between? The neck portion may remain open or vulnerable to biting cold winds but there is one fashion accessory that keeps one snugly warm and comfortable. They are real fur neck warmers from the house of Amifur, a fur specialist in Italy that cares for style and comfort in a beautiful package for beautiful women. Worn alone or combined with a fur hat, these neck warmers do add a pixie-like look to a lady’s look. This is one of the beauties of fur. One can wear neck warmers made of other materials but they do tend to resemble physio neck braces—a definite no-no when the style is what one wants. The back part of the warmer can be pulled up over the head to form a balaclava like the hood and also work as a sun guard. One can wear it like a headband and keep hair from getting into the eyes while cycling or engaged in work. It can be used to tie up the hair in a stylish way. Imaginative women can turn it inside out, place one end over the head and turn it around in a twist to form a beanie cap – a unique style statement. 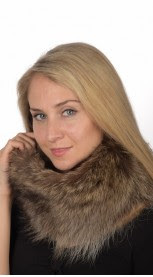 The neck warmer in fur is more than just a fashion accessory to make a woman look gorgeous. It can be used in different ways and that is all the more reason to own not just one but several, like a golden sable for occasions, a white rex for everyday use or a slinky mink one, each one with its unique characteristics and possibilities of use. In a way, it is more functional and stylish than a hat because it can be used in so many different ways and that makes it an indispensable fashion accessory for contemporary women.